Jumpsuits are my favorite go to fashion pieces because it doesn't require much when putting my look together. 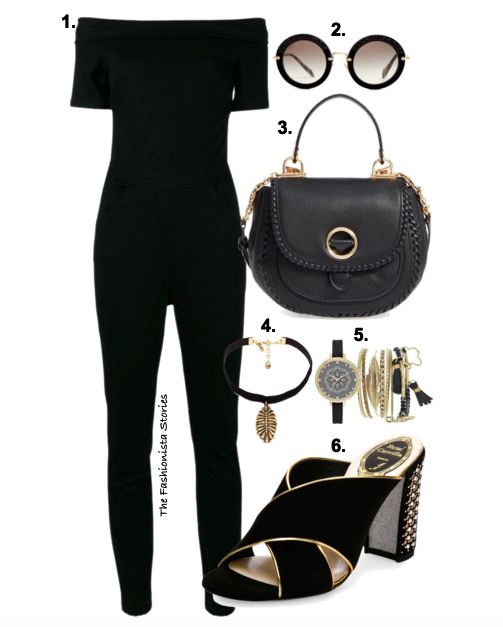 Today's Black Friday Style wardrobe inspiration features a basic jumpsuit which can be styled with flats, sneakers or heels. The accessories paired with it here gives it a chic, edgy touch. 1. 3X1 black off-the-shoulder jumpsuit, available at FARFETCH & SPRING. 2. MIU MIU Noir round frame sunglasses, available at MATCHES FASHION. 3. MICHAEL MICHAEL KORS 'Isadore' medium leather crossbody bag, available at NORDSTROM. 4. VANESSA MOONEY The Black Velvet Western charm choker, on sale at REVOLVE. 5. MIXIT black watch box set, on sale at JC PENNY. 6. RENE CAOVILLA black studded mule sandal, available at BERGDORF GOODMAN.